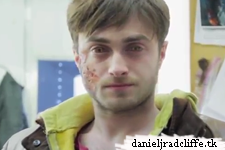 And another new video on Daniel's official Google+ page. (scroll down) It's the making of of The Transformation (from human to demon/devil) in Horns using VFX and Make Up/Prostetics. Photos were already on his page back in 2014. So this is a video that was shot during Horns. Let me give a little bit of context because it’s really cool and I want you to know what’s going on. There is a shot near the end of Horns where I kneel on the ground and the camera rotates around me as I transform from fully human into the demonic state I find myself in near the end of the film. To do this we had to film the same shot three times in 3 different stages of make-up, before clever members of the Visual Effects department seamlessly join them together to make them look like one. All in all, including the time spent in the make-up trailer and the VFX tent (that’s the bit in the vid where I’m standing in a dark room, rotating under flashing lights on a platform! It is futuristically referred to as ‘cyberscanning’!) and on set, it took about 8 hours to complete this shot. So in the video you see the phenomenally talented Mike McCarthy and Mike Fields cleaning, gluing, and painting me through the three stages of the Transformation(as it became known). These guys are amazing at what they do and anyone with a passing interest in Prosthetic Make-Up should watch this. I had fully expected the make up for the final stage alone to take 5 hours or more. As you see in the video, they did it A LOT faster than that. Near the end the wires you see them sticking to me under the wetsuit are ‘squibs’, which are the things that blow up under your costume when you get shot on screen. Other than that I think it’s all pretty self-explanatory, so I’ll shut up and let you watch. Thanks again to Mike M and Mike F for being incredible at your jobs and for playing great music. The song here is the brilliant Devil in Me by 22-20s (and if you like it you should buy the album!) - it seemed appropriate! DJR Holland is 9 years online!